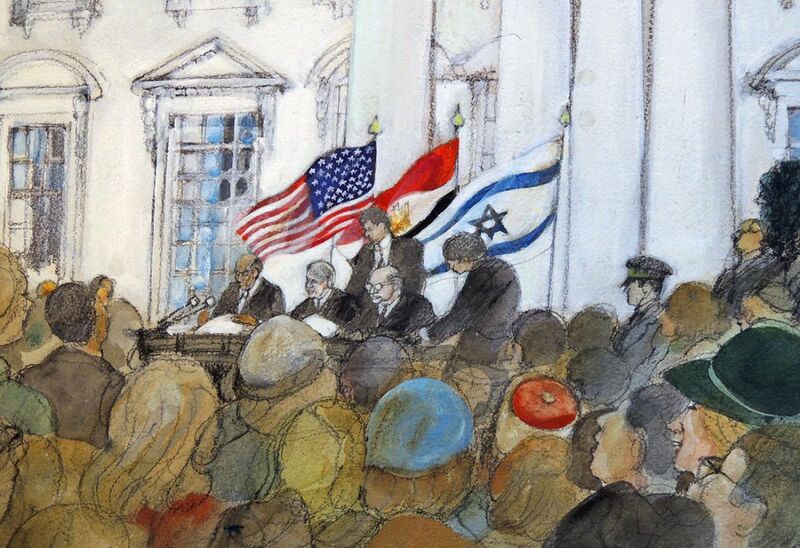 Franklin McMahon (1921-2012), Signing of Israeli/Egyptian Peace Accord, The White House, March 26, 1979. Acrylic paint on paper. 22 x 30″ Graphic Arts Collection GA 2015- in process. “Franklin McMahon, an artist who defied journalism’s preference for photographs to make a renowned career of drawing historic scenes in elegant, emphatic lines, died on Saturday in Lincolnshire, Ill. He was 90.” So begins the artist’s obituary written by Douglas Martin for the New York Times, March 7, 2012. The Graphic Arts Collection is pleased to have acquired several important paintings on paper by Franklin McMahon (1921-2012), documenting key moments in recent American history. We thank, in particular, his granddaughter Irene Burke, Class of 2016 and a member of the PUAM Student Advisory Board, for her help with these acquisitions. We also thank Jeremy Darrington, Politics Librarian, and David Magier, AUL for Collection Development, without whom these acquisitions would not have been possible. 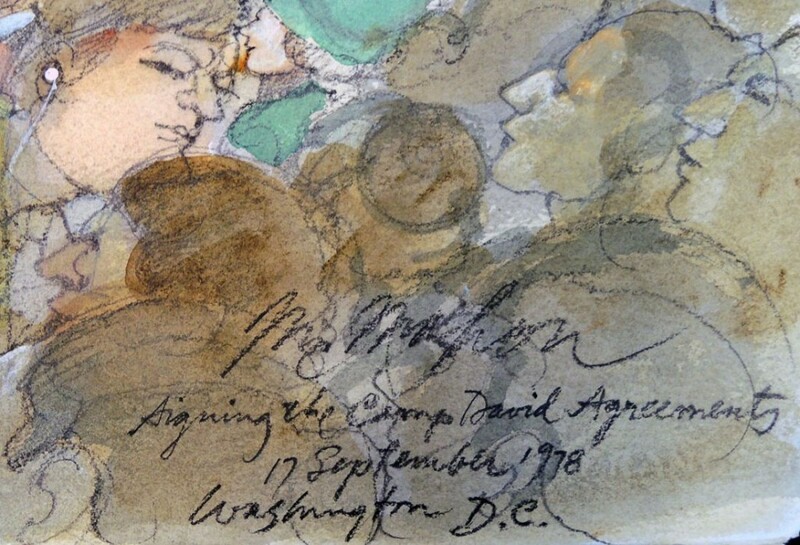 Here the artist notes the important date that led to the formal ceremony in 1979. 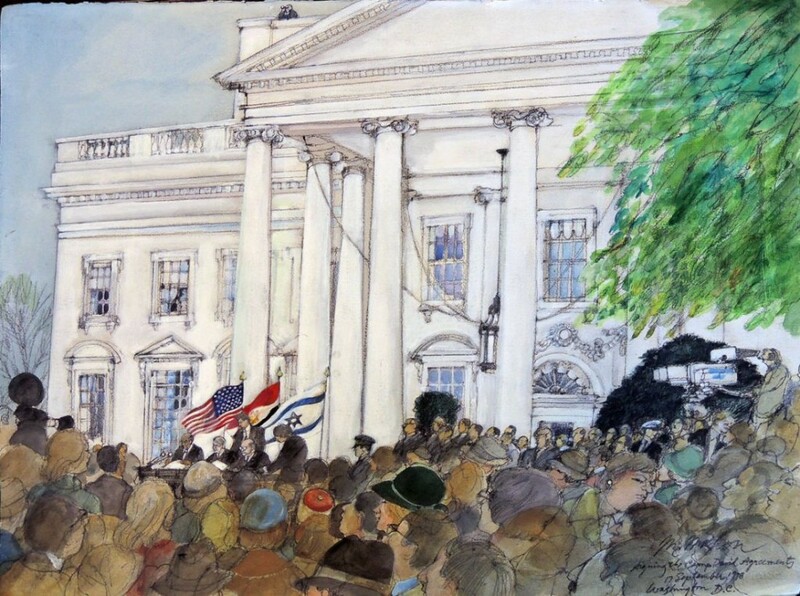 The first of our McMahon paintings documents the historic signing of the Israeli/Egyptian Peace Accord at the White House. “Israel and Egypt had been in a state of war since the Arab-Israeli War, which occurred immediately after the founding of Israel. Following the 1973 Yom Kippur War, the two nations began indirect peace negotiations through U.S. Secretary of State Henry Kissinger, who engaged in “shuttle diplomacy” by meeting with each nation’s representatives. For an in depth discussion of the events leading up to the signing, see the Carter Center’s transcript from the Camp David 25th Anniversary Forum held in 2003. This entry was posted in Acquisitions, painting and watercolors on December 29, 2015 by Julie Mellby.